Porcelain veneers are custom-made, ultra-thin shells of porcelain that are permanently bonded to the front and sides of your teeth. The all-porcelain veneers can be colored to either perfectly match the rest of your teeth, or whitened so that your smile is brilliantly white. After your teeth have been prepared, we will take an impression that will be sent to a dental laboratory or a digital impression with our highly advanced E4D CAD/CAM 3D porcelain veneer technology where your permanent porcelain veneers will be created exactly the way you want. While your porcelain veneers are being created, your doctor will place temporary veneers until the final. Once you have received your porcelain veneers, you will be able to smile with confidence, knowing that you have your perfect smile. Contact Arguello Dentistry today to find out more about our convenient payment options or to schedule your initial porcelain veneer consultation. During your dental crown procedure, we will determine which teeth are damaged or decayed. In order for the crown to be placed your doctor will have to remove the damage, decay and some of your natural tooth tissue. Generally the amount is small, typically 1-2 millimeters to provide for a strong restoration the feels natural to the tongue, lips and cheeks. Once your tooth is prepared, your doctor will take a mold of the tooth so that your custom-made crown can be created. We can create your new porcelain crown at Arguello Dentistry with our incredible E4D CAD/CAM 3-D technology. Many times, we can have it ready the same day if your schedule allows. Otherwise, you will return in a few weeks to have a beautiful, natural-looking and feeling permanent crown. In some cases, we will send the mold, along with specific instructions on what you would like for your crown, to a dental lab where your custom, permanent crown will be created. When permanent crown arrives from the dental lab, you will return to the office where your new crown will be bonded to your tooth. Dental crowns and bridges are all-porcelain, all gold, or porcelain fused to metal restorations that encompass and protect any tooth structure remaining above the gums like a cap. We can use crowns to correct a variety of challenges you may have with your teeth. Tooth crowns are used to restore and strengthen teeth that have been damaged and cannot be corrected with white fillings. 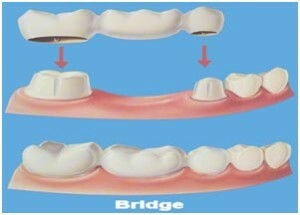 Dental bridges are similar and are used to correct gaps in smiles caused by missing teeth. Arguello Dentistry uses all-porcelain teeth crowns and dental bridges as much as possible so that your restored teeth match the rest of your natural teeth as closely as possible. Porcelain is excellent for a more natural appearance because it is not only color-matched to blend in but it is also translucent allowing light through, similar to your natural teeth. The technology for porcelain restorations continues to improve each year, and we see more natural-looking, stronger crowns and bridges as a result. Dental bridges are used to fill the space created when you lose a tooth. Dental bridges are a treatment that has been around for many years. It is one solution to restore your smile, bite and chewing capabilities and also prevents other teeth from drifting out of place into the gap of the missing tooth. When possible a dental implant is the preferred method to replace one or more missing teeth since implants do not involve taking away healthy natural tooth structure from teeth adjacent to the missing tooth. A dental bridge is place on the teeth or implants on either side of the gap created by the missing tooth. In order for a dental bridge to be placed, your doctor will shape the neighboring teeth or implants so that they can support the bridge. Once the teeth have been reshaped we will make an impression of the entire area. This impression will be sent to a dental lab that will create your permanent bridge. While the permanent bridge is being created we will place a temporary bridge on the abutment teeth to maintain the positions of the teeth and allow normal function and esthetics. When the permanent porcelain bridge returns from the dental lab, you will return to our office so your doctor can cement or bond the dental bridge in place. A damaged or decayed tooth can compromise the health of your mouth and smile. Dr. Arguello can restore the appearance of your teeth with a variety of treatments, including dental inlays and dental onlays. Dental inlays and onlays are restorations to replace damaged parts of the tooth with a more permanent restoration without having to prepare the entire tooth. This works only in certain situations and has to be evaluated by Dr. Arguello to see if it is an option for you. It is essentially done when medium to large fillings are needed but the rest of the tooth is healthy. 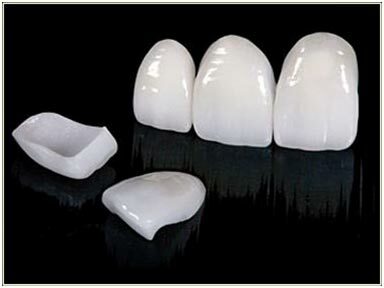 Think of it as a partial crown using only the best material that will last a lifetime. All inlays and onlays are guaranteed for life as long as proper maintence schedule is kept. The difference between a inlay/onlay vs a regular filling is the material placed. 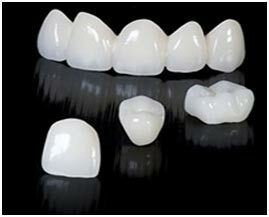 A composite resin filling although beautiful has its limitations with strengths and durability. A inlay/onlay is usually the same material that a crown is made of. It is impossible to break under normal use. If you’d like to find out how dental inlays & dental onlays and other procedures could help bring beauty back to your smile, please call Arguello Dentistry today at 954-532-1274.